RENO, Nev. (April 15, 2015) — Both the Nevada State Senate and the Nevada Assembly will open sessions with Hindu mantras at the State Capitol in Carson City on April 17. 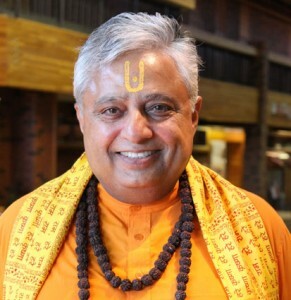 The mantras, containing verses from world’s oldest existing scripture, will be delivered by Hindu statesman Rajan Zed, who is the President of Universal Society of Hinduism based in Reno. Zed will deliver the invocations from sacred Sanskrit scriptures before both legislative bodies, in addition to reading the English translation of the prayers from the Sanskrit, considered a root language of Indo-European languages. Lieutenant Gov. Mark Hutchison serves as President of the Nevada State Senate which has 21 members. Assemblyman John Hambrick serves as Speaker over an Assembly of 42 members. Brian Sandoval is the Governor of Nevada. Zed will recite from Rig-Veda, the oldest scripture of the world still in common use, besides lines from Upanishads and Bhagavad-Gita (Song of the Lord), both ancient Hindu scriptures. He plans to start and end the prayer with “Om”, the mystical syllable containing the universe, which in Hinduism is used to introduce and conclude religious work. Reciting from Brahadaranyakopanishad, Rajan Zed plans to say “Asato ma sad gamaya, Tamaso ma jyotir gamaya, Mrtyor mamrtam gamaya”, which he will then interpret as “Lead us from the unreal to the Real, Lead us from darkness to Light, andLead us from death to immortality.” Reciting from Bhagavad-Gita, he proposes to urge Senators and Assembly-members to keep the welfare of others always in mind. In the state of Nevada, Zed has already delivered Hindu prayers at City Councils of Las Vegas, Henderson, Sparks and Boulder City; in addition to Clark County Board of Commissioners and Carson City Board of Supervisors. Besides Nevada, he has also read opening prayers in United States Senate, U.S. House of Representatives, various state senates and houses of representatives, county boards and city councils all over the country. Hinduism, the oldest and third largest religion of the world, has about one billion adherents and moksh (liberation) is its ultimate goal. There are about three million Hindus in USA. As a world interfaith leader, Zed addresses the cause of religions worldwide, and uses his voice against human rights violations against approximately 15-million Roma (Gypsies) in Europe.